Thorlabs offers single mode patch cables with FC/PC connectors on both ends. Each cable is manufactured in our facility on state-of-the-art equipment. Available from stock, these cables feature Ø3 mm PVC protective jackets with internal kevlar threads for durability in the lab. Each patch cable includes two protective caps that shield the ferrule ends from dust and other contaminants. Additional CAPF Plastic Fiber Caps and CAPFM Metal Threaded Fiber Caps for FC/PC-terminated ends are also sold separately. Mating sleeves are available to connect FC to FC and FC to SMA connectors. These mating sleeves minimize back reflections and ensure proper alignment of the cores of each terminated fiber end. For shorter wavelengths, Thorlabs also offers Low-Insertion-Loss Patch Cables, which feature handpicked single mode fiber with tighter core concentricity specifications for lower insertion loss and higher transmission. We also offer AR-Coated Single Mode Patch Cables, which have an antireflective coating on one fiber end for higher performance in fiber-to-free space applications. If you cannot find the appropriate stock patch cable your application requires, Thorlabs also offers custom patch cables with same-day shipping. Fiber is hand selected to ensure higher cutoff wavelength. For SM operation near the cutoff wavelength, launch conditions need to be taken into consideration. MFD is nominal, calculated value, estimated at the operating wavelength(s). Attenuation is specified for unterminated fiber. Not all cable types are available in all lengths. For custom length cables see our Custom Cables page. Wavelength range is illustrative and not guaranteed. Attenuation of SM2000 fiber is highly dependent on wavelength. FC/PC and FC/APC Patch Cables are equipped with either a 2.0 mm narrow or 2.2 mm wide alignment key that fits into a corresponding slot on a mated component. These keys and slots are essential to correctly align the cores of connected fiber patch cables and minimize the insertion loss of the connection. As an example, Thorlabs designs and manufactures mating sleeves for FC/PC- and FC/APC-terminated patch cables to precise specifications that ensure good alignment when used correctly. To ensure the best alignment, the alignment key on the patch cable is inserted into the slot on the corresponding mating sleeve. Thorlabs offers mating sleeves with 2.2 mm wide-key slots or 2.0 mm narrow key slots. 2.2 mm wide-key-slot mating sleeves are compatible with both wide-key and narrow-key connectors. However, using a narrow-key connector in a wide-key slot will allow the connector to rotate slightly in the mating sleeve (as shown in the animation below and to the left). While this configuration is acceptable for patch cables with FC/PC connectors; for FC/APC applications, we recommend using narrow-key-slot mating sleeves to ensure optimum alignment. 2.0 mm narrow-key-slot mating sleeves allow for optimal alignment of angled, narrow-key FC/APC connectors, as shown in the animation below and to the right. Therefore, they are not compatible with connectors that have a 2.2 mm wide key. Please note that all FC/PC and FC/APC patch cables manufactured by Thorlabs use narrow key connectors. Once a narrow key connector is inserted into a narrow-key-slot mating sleeve, the connector will not rotate. We therefore recommend these mating sleeves for FC/PC and FC/APC connectors with narrow keys. When a narrow key connector is inserted into a wide-key-slot mating sleeve, the connector has room to rotate. For narrow key FC/PC connectors, this is acceptable, but for narrow key FC/APC connectors, significant coupling losses will result. The following tutorial details damage mechanisms relevant to unterminated (bare) fiber, terminated optical fiber, and other fiber components from laser light sources. These mechanisms include damage that occurs at the air / glass interface (when free-space coupling or when using connectors) and in the optical fiber itself. A fiber component, such as a bare fiber, patch cable, or fused coupler, may have multiple potential avenues for damage (e.g., connectors, fiber end faces, and the device itself). The maximum power that a fiber can handle will always be limited by the lowest limit of any of these damage mechanisms. While the damage threshold can be estimated using scaling relations and general rules, absolute damage thresholds in optical fibers are very application dependent and user specific. Users can use this guide to estimate a safe power level that minimizes the risk of damage. Following all appropriate preparation and handling guidelines, users should be able to operate a fiber component up to the specified maximum power level; if no maximum is specified for a component, users should abide by the "practical safe level" described below for safe operation of the component. Factors that can reduce power handling and cause damage to a fiber component include, but are not limited to, misalignment during fiber coupling, contamination of the fiber end face, or imperfections in the fiber itself. For further discussion about an optical fiber’s power handling abilities for a specific application, please contact Thorlabs’ Tech Support. There are several potential damage mechanisms that can occur at the air / glass interface. Light is incident on this interface when free-space coupling or when two fibers are mated using optical connectors. High-intensity light can damage the end face leading to reduced power handling and permanent damage to the fiber. For fibers terminated with optical connectors where the connectors are fixed to the fiber ends using epoxy, the heat generated by high-intensity light can burn the epoxy and leave residues on the fiber facet directly in the beam path. All values are specified for unterminated (bare) silica fiber and apply for free space coupling into a clean fiber end face. This is an estimated maximum power density that can be incident on a fiber end face without risking damage. Verification of the performance and reliability of fiber components in the system before operating at high power must be done by the user, as it is highly system dependent. This is the estimated safe optical power density that can be incident on a fiber end face without damaging the fiber under most operating conditions. Damage mechanisms on a fiber end face can be modeled similarly to bulk optics, and industry-standard damage thresholds for UV Fused Silica substrates can be applied to silica-based fiber. However, unlike bulk optics, the relevant surface areas and beam diameters involved at the air / glass interface of an optical fiber are very small, particularly for coupling into single mode (SM) fiber. therefore, for a given power density, the power incident on the fiber needs to be lower for a smaller beam diameter. The table to the right lists two thresholds for optical power densities: a theoretical damage threshold and a "practical safe level". In general, the theoretical damage threshold represents the estimated maximum power density that can be incident on the fiber end face without risking damage with very good fiber end face and coupling conditions. The "practical safe level" power density represents minimal risk of fiber damage. Operating a fiber or component beyond the practical safe level is possible, but users must follow the appropriate handling instructions and verify performance at low powers prior to use. The effective area for single mode (SM) fiber is defined by the mode field diameter (MFD), which is the cross-sectional area through which light propagates in the fiber; this area includes the fiber core and also a portion of the cladding. To achieve good efficiency when coupling into a single mode fiber, the diameter of the input beam must match the MFD of the fiber. The effective area of a multimode (MM) fiber is defined by the core diameter, which is typically far larger than the MFD of an SM fiber. For optimal coupling, Thorlabs recommends focusing a beam to a spot roughly 70 - 80% of the core diameter. The larger effective area of MM fibers lowers the power density on the fiber end face, allowing higher optical powers (typically on the order of kilowatts) to be coupled into multimode fiber without damage. Plot showing approximate input power that can be incident on a single mode silica optical fiber with a termination. Each line shows the estimated power level due to a specific damage mechanism. The maximum power handling is limited by the lowest power level from all relevant damage mechanisms (indicated by a solid line). Fibers terminated with optical connectors have additional power handling considerations. Fiber is typically terminated using epoxy to bond the fiber to a ceramic or steel ferrule. When light is coupled into the fiber through a connector, light that does not enter the core and propagate down the fiber is scattered into the outer layers of the fiber, into the ferrule, and the epoxy used to hold the fiber in the ferrule. If the light is intense enough, it can burn the epoxy, causing it to vaporize and deposit a residue on the face of the connector. This results in localized absorption sites on the fiber end face that reduce coupling efficiency and increase scattering, causing further damage. For several reasons, epoxy-related damage is dependent on the wavelength. In general, light scatters more strongly at short wavelengths than at longer wavelengths. Misalignment when coupling is also more likely due to the small MFD of short-wavelength SM fiber that also produces more scattered light. To minimize the risk of burning the epoxy, fiber connectors can be constructed to have an epoxy-free air gap between the optical fiber and ferrule near the fiber end face. Our high-power multimode fiber patch cables use connectors with this design feature. When fiber cables or components have multiple avenues for damage (e.g., fiber patch cables), the maximum power handling is always limited by the lowest damage threshold that is relevant to the fiber component. In general, this represents the highest input power that can be incident on the patch cable end face and not the coupled output power. As an illustrative example, the graph to the right shows an estimate of the power handling limitations of a single mode fiber patch cable due to damage to the fiber end face and damage via an optical connector. The total input power handling of a terminated fiber at a given wavelength is limited by the lower of the two limitations at any given wavelength (indicated by the solid lines). A single mode fiber operating at around 488 nm is primarily limited by damage to the fiber end face (blue solid line), but fibers operating at 1550 nm are limited by damage to the optical connector (red solid line). In the case of a multimode fiber, the effective mode area is defined by the core diameter, which is larger than the effective mode area for SM fiber. This results in a lower power density on the fiber end face and allows higher optical powers (on the order of kilowatts) to be coupled into the fiber without damage (not shown in graph). However, the damage limit of the ferrule / connector termination remains unchanged and as a result, the maximum power handling for a multimode fiber is limited by the ferrule and connector termination. Please note that these are rough estimates of power levels where damage is very unlikely with proper handling and alignment procedures. It is worth noting that optical fibers are frequently used at power levels above those described here. However, these applications typically require expert users and testing at lower powers first to minimize risk of damage. Even still, optical fiber components should be considered a consumable lab supply if used at high power levels. In addition to damage mechanisms at the air / glass interface, optical fibers also display power handling limitations due to damage mechanisms within the optical fiber itself. These limitations will affect all fiber components as they are intrinsic to the fiber itself. Two categories of damage within the fiber are damage from bend losses and damage from photodarkening. Bend losses occur when a fiber is bent to a point where light traveling in the core is incident on the core/cladding interface at an angle higher than the critical angle, making total internal reflection impossible. Under these circumstances, light escapes the fiber, often in a localized area. The light escaping the fiber typically has a high power density, which burns the fiber coating as well as any surrounding furcation tubing. A special category of optical fiber, called double-clad fiber, can reduce the risk of bend-loss damage by allowing the fiber’s cladding (2nd layer) to also function as a waveguide in addition to the core. By making the critical angle of the cladding/coating interface higher than the critical angle of the core/clad interface, light that escapes the core is loosely confined within the cladding. It will then leak out over a distance of centimeters or meters instead of at one localized spot within the fiber, minimizing the risk of damage. Thorlabs manufactures and sells 0.22 NA double-clad multimode fiber, which boasts very high, megawatt range power handling. A second damage mechanism, called photodarkening or solarization, can occur in fibers used with ultraviolet or short-wavelength visible light, particularly those with germanium-doped cores. Fibers used at these wavelengths will experience increased attenuation over time. The mechanism that causes photodarkening is largely unknown, but several fiber designs have been developed to mitigate it. For example, fibers with a very low hydroxyl ion (OH) content have been found to resist photodarkening and using other dopants, such as fluorine, can also reduce photodarkening. Even with the above strategies in place, all fibers eventually experience photodarkening when used with UV or short-wavelength light, and thus, fibers used at these wavelengths should be considered consumables. These general cleaning and operation guidelines are recommended for all fiber optic products. Users should still follow specific guidelines for an individual product as outlined in the support documentation or manual. Damage threshold calculations only apply when all appropriate cleaning and handling procedures are followed. All light sources should be turned off prior to installing or integrating optical fibers (terminated or bare). This ensures that focused beams of light are not incident on fragile parts of the connector or fiber, which can possibly cause damage. The power-handling capability of an optical fiber is directly linked to the quality of the fiber/connector end face. Always inspect the fiber end prior to connecting the fiber to an optical system. The fiber end face should be clean and clear of dirt and other contaminants that can cause scattering of coupled light. Bare fiber should be cleaved prior to use and users should inspect the fiber end to ensure a good quality cleave is achieved. If an optical fiber is to be spliced into the optical system, users should first verify that the splice is of good quality at a low optical power prior to high-power use. Poor splice quality may increase light scattering at the splice interface, which can be a source of fiber damage. Users should use low power when aligning the system and optimizing coupling; this minimizes exposure of other parts of the fiber (other than the core) to light. Damage from scattered light can occur if a high power beam is focused on the cladding, coating, or connector. Optical fibers and fiber components should generally be operated within safe power level limits, but under ideal conditions (very good optical alignment and very clean optical end faces), the power handling of a fiber component may be increased. Users must verify the performance and stability of a fiber component within their system prior to increasing input or output power and follow all necessary safety and operation instructions. The tips below are useful suggestions when considering increasing optical power in an optical fiber or component. Splicing a fiber component into a system using a fiber splicer can increase power handling as it minimizes possibility of air/fiber interface damage. Users should follow all appropriate guidelines to prepare and make a high-quality fiber splice. Poor splices can lead to scattering or regions of highly localized heat at the splice interface that can damage the fiber. After connecting the fiber or component, the system should be tested and aligned using a light source at low power. The system power can be ramped up slowly to the desired output power while periodically verifying all components are properly aligned and that coupling efficiency is not changing with respect to optical launch power. Bend losses that result from sharply bending a fiber can cause light to leak from the fiber in the stressed area. When operating at high power, the localized heating that can occur when a large amount of light escapes a small localized area (the stressed region) can damage the fiber. Avoid disturbing or accidently bending fibers during operation to minimize bend losses. Users should always choose the appropriate optical fiber for a given application. For example, large-mode-area fibers are a good alternative to standard single mode fibers in high-power applications as they provide good beam quality with a larger MFD, decreasing the power density on the air/fiber interface. Step-index silica single mode fibers are normally not used for ultraviolet light or high-peak-power pulsed applications due to the high spatial power densities associated with these applications. It is possible to calculate the MFD for different wavelengths using Marcuse's equation. For this fiber being operated at 795nm, the equation yielded a Mode Field Diameter of ~5.34um. Thank you for contacting Thorlabs. SM450 can be used at wavelengths up to 650nm however the bend loss will be high at about 35 dB per loop for a 30mm bend radius. The dispersion at 650nm is about 57ps^2/km. I will contact you directly with more information about the attenuation. Thank you for your feedback. We will contact you directly to discuss potential solutions for your application. How much power can the P1-460B-FC-2 and P1-630A-FC-2 fibers tolerate when coupling? We burnt the edge of the fiber (three of P1-460B-FC-2 and one of P1-630A-FC) when using only 01 mW of input light. We are using 532 nm pulsed laser at 6 ns pulse width. The coupling efficiency was only 30% when the edge of the fibers was burnt. Hello, thank you for contacting Thorlabs. Typical power limits for a connectorized fiber are about 300mW of CW power, but this is limited by the adhesive that holds the fiber in the connector, and it assumes that the coupling efficiency has already been maximized. If the coupling efficiency is low, then the lost light can be absorbed by the adhesive. Also keep in mind that the damage threshold is greatly reduced if the face of the fiber is scratched or dirty, and fibers should be cleaned before they are added to a system. I will contact you directly. Hi, I'd like to know the MFD for S405-HP @ 514.5 nm & 532 nm. Any available informaion? Whats the group delay dispersion of the fiber at 780nm? Response from Bweh at Thorlabs USA: I will contact you with an estimate. This is your web page on pigtai LD : http://www.thorlabs.co.jp/newgrouppage9.cfm?objectgroup_id=1489 It looks that your fiber used in pigtailed LD handles much mor power than the guideline of DT. How do the fiber in your pigtail LD manage such the high power ? Response from Jeremy at Thorlabs: Typically the limitation for power handling in connectorized fiber depends on the coupling efficiency and cleanliness of the fiber end face. If the coupling efficiency is very high and the fiber end face is clean, then one could couple much more power into the fiber than the general safe guideline we provided. What is the electrical high-voltage strength of these fiber cables? Please specify applicable electrical voltage per cm or per m cable length. Response from Jeremy at Thorlabs: All the materials inside the patch cable (fiber, PVC jacket, polypropylene inner tube, Kevlar threads) have higher breakdown voltage than air. Therefore breakdown will occur in air before it will occur in the fiber optic cable. Why do you sell 1550BHP? What would be advantage for the more expensive fiber patch? Response from Jeremy at Thorlabs: The 1550BHP was initially offered as a lower bend-loss alternative to SMF-28e+ fiber. However, with the addition of the CCC1310-J9 fiber at a later date, the clear advantage has vanished. There are some customers who have designed systems around this specific fiber and we have decided to continue carrying the 1550BHP fiber for ease of procurement for our customers. Hi. I would like to send a 6 ps @810nm pulse through a very long fiber (25m). I wonder how much dispersion I will get and how much power I can couple in a SM fiber. Thank you. Response from Chris at Thorlabs: Thank you for using out feedback tool. Dispersion is going to be dependent on the specific fiber which you are using. Not all single mode fiber is going to have the same value for this. I will contact you directly to discuss this with you. Could you specify the maximum power which e.g. the P1-980A-FC-2 can support? I am using 1083 nm, cw. I already read in the comments below that one should use low powers for the initial coupling to not burn the cladding, but once it is well coupled in, how much power can be used? Response from Phong at Thorlabs: Thank you for your post. Once the laser is well coupled into the fiber, we typically provide safe guideline values of 300 mW for visible wavelengths. However, due to the wavelength dependency, at 980 nm, you may be able to couple as much as 3 W with 90% chance of success. If you increase the power to 5 W, you may get 50% success. For 10 W, you may see only 10% success. Due to misalignment, hot spots can form, resulting in damage to the connector's epoxy. Hi, This fiber is specced for 450-600nm: http://www.thorlabs.de/_QLPopup.cfm?PN=460HP What happens if it is operated at 640 nm for example? Do you know the material dispersion as a function of wavelength for this fiber? Response from Tim at Thorlabs: Thank you for your inquiry. If you use a wavelength above the operating wavelength, the light is being guided further into the cladding. It will still be single mode, the dispersion will become smaller and the theoretical attenuation will be lower. However, the fiber will be much more sensitive to bend losses and in reality you will have light leaking into the cladding. Response from Jeremy at Thorlabs: The coupling efficiency is going to be dependent on how close the mode fields overlap between the fiber and your focused spot. Having good control of the position and tip/tilt stage helps as well. I will get in touch with you to discuss about your application and some parts for cleaning and polishing your fiber. Have you tested the coupling efficiency for P1-630A-FC-2? 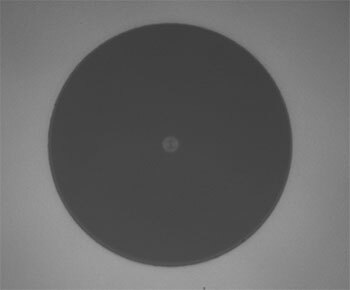 We used a 20X objective and found the coupling efficiency is only 10%. Can you suggest some optomechanics for us to enhance the efficiency? Also, we suspect the fiber may be burnt at the edge. Do you have some methods to polish the fiber? Response from Tim at Thorlabs: Thank you for your feedback. The dispersion will be characteristic of the fiber and wavelength used. I have contacted you directly for more information. Do you happen to know the GVD (dispersion) of the fiber (glass). I would like to calculate an expected dispersion from a 1 ps pulse after my patch cable. Response from Buki at Thorlabs: Thank you for your feedback. We will contact you for more information and to examine and replace your fiber. Please note that 16mW focused onto a single mode fiber core could get up to a power density of 200KW/cm^2. A small shift in the focal spot would move the light into the cladding where the epoxy could burn. It is best to use lower power levels for initial coupling efforts and then increase the power when your light is focused on the core of the fiber, instead of the edge of the fiber. How much power can this fiber tolerate when coupling? We burnt the edge of one of our fibers and we were using only 16 mW of light at output. Response from Buki at Thorlabs: Thank you for your question about the performance of the P1-2000-FC-2 at 2.3um. This patch cable uses SM2000 fiber, which we expect to have about 300dB/km attenuation around 2.3um. This is a moderate amount of attenuation, but with just a 2 meter length fiber this is equivalent to about 13% attenuation. Please contact TechSupport@thorlabs.com if you have any further questions. Do you have any knowledge of the performance of the P1-2000-FC-2 at 2.3 micron? Any idea of the attenuation at this wavelength? Will it work or should I stick to the multi-mode fibers for this wavelength. A further response from Adam at Thorlabs to Mario: We are intrigued by the application and will be providing samples of what we believe may work. Also, once we have a design we will add it to our standard product line of optical cables. A response at Adam at Thorlabs to Mario: We have two options that I think may work well for your application. We can provide a black 3.0mm diameter jacket, FT030, for these fibers or we can provide a 5.1mm diameter stainless steel jacket, FT051SS. These can be ordered as custom patch cables. I will email you directly to see if you are interested in either of these options. Response from Laurie at Thorlabs to samleeis: A member of our technical support staff will be contacting you directly to provide a quote, discuss the available shipping options, and suggest solutions for coupling the light from a monochromator into the fiber. I got a P1-405A-FC-5 last month. I would like a quote for a 100 m version of the 405 nm FC single mode patch cable. Is it available for next day shipping? I cannot find the diameter of the core in your website, but only the MFD of 3.2 um. I am interested in the wavelength range of 395 to 475 nm. Do you have any information about the reflection and attenuation there? I am going to couple the light from a monochromator into the P1-405A optical fiber. Do you have any suggestion on what optical parts (ie. lens(es), optical funnel) that I can buy to do this? A response from Tyler at Thorlabs to dmkg: Our application engineers will send you a quote for the patch cable you are interested in. We have dedicated manufacturing capability devoted to the production of small volume orders of custom fiber patch cables for individual customers, which allows us to offer same day or next day shipping on most orders while minimizing the cost of the patch cord. Is it possible to get a 10m version of the 405 nm FC single mode patch cable? And what would be the cost of such a cable? To: pasquale.bianco -- The single mode P1-830A-FC-2 is not a polarization-maintaining fiber. We do carry a line of polarization-maintaining single mode fibers. Please see the following link: http://www.thorlabs.com/NewGroupPage9.cfm?ObjectGroup_ID=1596&visNavID=681. If you would like some help with finding a fiber that meets your needs, please feel free to call our European offices at +49 (0) 8131-5956-0 and speak to one of our application engineers. Thank you for your interest in Thorlabs, and we hope that this information is helpful to you. Max attenuation data is for unterminated fiber. The wavelength range is the spectral region between the cutoff wavelength and the bend edge and represents the region where the fiber transmits the TEM00 mode with low attenuation. For this fiber, the bend edge wavelength is typically 200 nm longer than the cutoff wavelength. The design wavelengths are 980 nm, 1064 nm, and 1550 nm. Attenuation for SM2000 fiber is highly dependent on wavelength. Attenuation data is for unterminated fiber.